It is becoming a habit – between Christmas and New Year's Day I take a “working vacation” and head for St George, where I spend my days exploring the red rock while enjoying the mild temperatures. Today we did two short hikes on the edge of Snow Canyon State Park, crossing sand dunes and washes as we searched cliff faces for ancient Native American rock art. Both were enjoyable, relatively easy outings suitable for all ages including younger kids. The weather was perfect. The sun felt warm and we quickly shed jackets. The temperature pushed up into the low 50s F while we were hiking. We say many other people out riding bikes. We also saw a surprising number of people out riding horses on trails just east of St George. And, or course, there were people out golfing - St George is famous for its golf courses. The links were not crowded but golfing conditions were good and we could see several people testing their skills as we drove past area golf course. Did we find rock art? 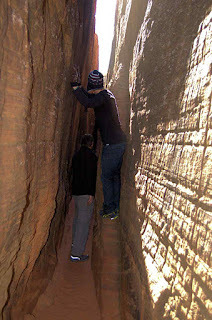 Yes, we found very interesting old figures in a little-known slot on the east edge of Snow Canyon. You can see the slot and some of the figures in my photos here. We drive up Hwy 18, heading north from St George, and then turned west onto 4200 North just before we reached The Ledges golf course. 4200 North is a dirt street that dead ends after a short distance. We parked at the dead end and followed a narrow trail access right of way between two houses and then west into the state park. To find the rock art we just walked into the prominent wash that is visible from the fence that marks the state park boundary. As you descend into the wash you will see rock cairns in several spots. 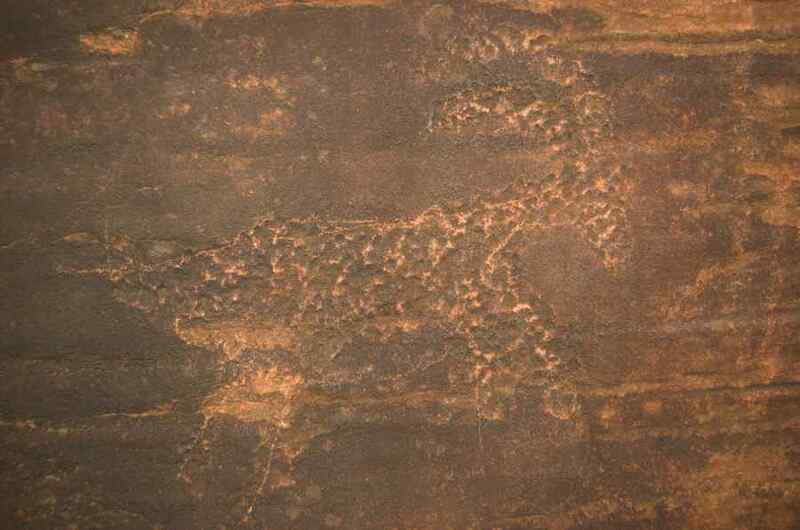 There is no official trail to the slot where the rock art is found. Rather, cairns mark several possible approaches. We just choose a path that seemed easiest for our group. If you pay attention you will notice a couple trail marker signs placed by the park service to identify the slot. They warm that it is illegal to deface the rock art, which is considered a valuable cultural resource. Notice I’m not giving precise directions or GPS coordinates. Part of the fun is exploring and searching. I find it very rewarding to search and find rock art. Ancient figures can be found on both walls in the slot. They are faint – you have to pay attention to see them. They are petroglyphs, etched into the rock face. The rock’s surface is dark, covered with a patina. The dark patina also covers the images, making them hard to distinguish in the shadowy slot. The patina is an indication that the figures are relatively old. The figures themselves show animals (many sheep) and other forms. By themselves, they are not remarkable. 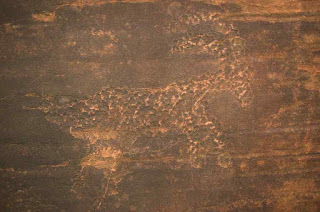 There are hundreds of rock art panels in southern Utah and these are similar to many images found elsewhere. 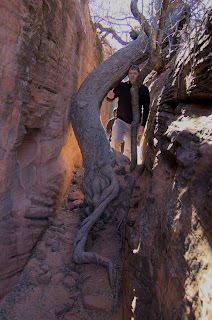 But the art in its context in the narrow slot, surrounded by Snow Canyon’s marvelous scenery, made the hike was very enjoyable. It was great to escape into the warm sunshine of Utah’s Dixie.